Meg Russell's Lords Secondary Legislation Scrutiny Committee evidence on the Strathclyde review and the Lords. In addition to the PACAC evidence, Meg Russell has now given evidence to the House of Lords Secondary Legislation Scrutiny Committee on the effective scrutiny of secondary legislation for each of the three options set out in Lord Strathclyde's report on Tuesday 9 February 2016. The session can be watched on the parliament website (Starts at 16:52) and the transcript can also be found on their website. 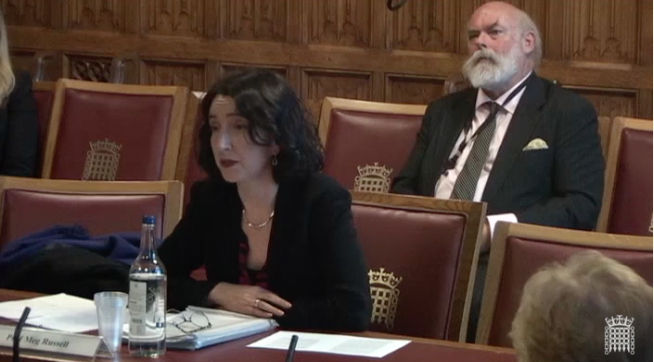 The questions covered the pre-existing conventions about the House of Lords' treatment of secondary legislation, the relationship between the two Houses of Parliament, and the consequences of implementing the three options set out by the Strathclyde report. The committee inquired about the viability of option 2 in the report (a non-statutory, binding resolution, to be agreed to by House of Lords), and the principal points of tension that would arise in finding a consensus about the terms of any resolution, the potential effects of replacing the House of Lords' power of veto over secondary legislation with a power of delay by statute as per option 3 and the safeguards that would need to be in place if if this was implemented. The session discussed the implications of the recommendations in the report for the quality of legislative scrutiny, and what should happen next. Professor Russell suggested that option 2 was the most viable, but that one of the consequences of the Strathclyde process has been that the big question about the scope of the secondary legislation, and appropriate boundaries between this and primary legislation has now firmly reached the political agenda.